All BRAND NEW furniture, beds, mattresses, linens, etc. 6 adults will sleep comfortably on the new queen sized beds, which feature individual pocket coil mattresses with pillow tops in both of the bedrooms, and a queen Simmons Beautyrest on the pull out sofa bed in the living room. Enjoy views of the gorgeous swimming pool, and lush gardens of the Pinnacle Pointe Resort from your spacious west facing balcony. This home is appointed with many luxuries, including unlimited Wi-fi with High Speed Internet, 42" HD flat screen TV in living room, where you can enjoy endless movies on Netflix, Kuerig K-Cup coffee machine in the well equipped kitchen, secure keyless touch pad entry, central A/C, and in-suite washer / dryer. This condominium comes with a parking stall in the secure covered parking very close to the gate. Also, enjoy the quiet of being on the 5th (Top) Floor. Resort amenities include a large heated swimming pool, sun loungers, hot tub, and a well appointed exercise/fitness room. Pinnacle Pointe is situated on the famous golf courses of Quail and Bear. From your front door you are only steps away from these two championship courses. Kelowna (YLW) Airport is a short 4 minute drive or cab ride away. Nearby amenities include restaurants, Starbucks, Nesters grocery store, liquor store and more. Enjoy spectacular wineries starting at only 11 minutes away, a variety of incredible Okanagan lakes and the renowned Okanagan Rail Trail, just 4 minutes away. Activity options for the family and kids also include go-carts, mini golf, batting cages, and the Grand 10 cinema. This condominium has been prepared to make your vacation as comfortable and convenient as possible. Please don't hesitate to inquire about any additional information. Location close to the airport. Cary was very attentive and helpful with anything that was needed. Big & Spacious and close to everything! Big & Spacious and close to everything - Golf, Airport, UBCO, Restaurants, Shopping. Great 2 bedroom, 2 bath condo! My family and I stayed in Cary’s 2 bedroom, 2 bath condo in early August 2018. The condo was extremely clean and quiet. The beds were very comfortable, large living room with very accommodating furniture, a well equipped kitchen, and even a washer and dryer! 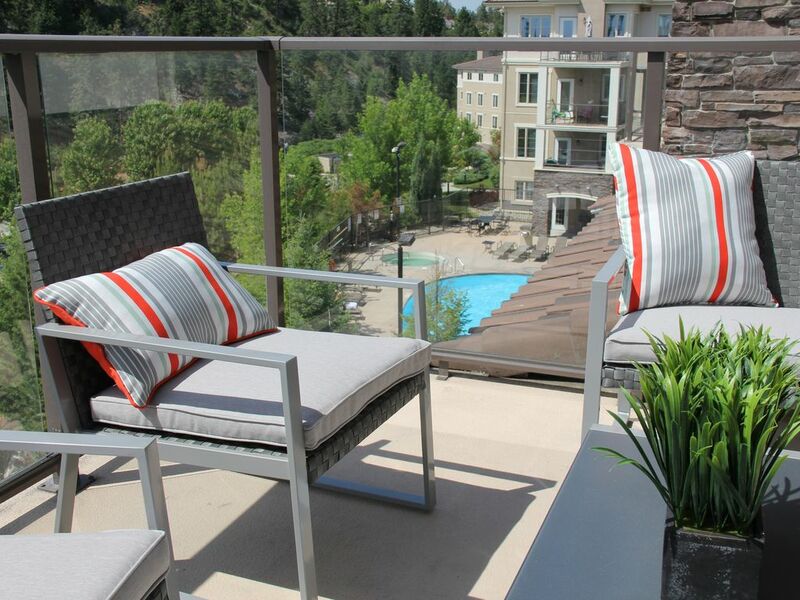 The balcony is a wonderful place to relax with a good book, or just sit and enjoy family. Check-in was quick and easy. Location was perfect with easy access to any location in the area. Just a overall great experience. Highly recommended!